The ARRL website and some services will be down for maintenance for up to 4 hours on Wednesday, June 20, starting at approximately midnight EDT (0400 UTC on Thursday, June 21). During this period some or all systems may be temporarily inaccessible, including all content on the ARRL website and the ARRL Store. Logbook of The World (LoTW) and email will not be affected, nor should the ARRL Contest Club Eligibility Lists or Contest Log Submission pages. We apologize for any inconvenience. The popular Reverse Beacon Network (RBN) has announced that it's now offering -- as a beta test -- a separate telnet feed for FT8 spots (telnet.reversebeacon.net port 7001), in addition to the current spot feed (telnet.reversebeacon.net port 7000), which will be repurposed to handle only CW and RTTY spots. In addition, a beta version of Aggregator Version 5 that can handle FT8 spots received from WSJT-X will be available on the RBN website, with instructions on how RBN node operators can configure their nodes to spot FT8 call signs on one or more bands; this will not interfere with the ability to spot CW and RTTY call signs, the RBN team assured in its announcement, explaining its reasoning for the move. The beta test follows a limited alpha test aimed at getting a feel for the spot load and other implications of carrying FT8 spots on the RBN. "The most striking characteristic of FT8 spots is their sheer quantity," the RBN announcement said, citing weekday statistics from May 23 and 24 when FT8 spots represented 86% and 87% of all spots, respectively, while CW spots were 13% and 14%, respectively, and RTTY spots were below 1%. Throughput on both days totaled some 30,000 spots. "Whether due to the startling popularity of the new mode, or to the ability to spot stations at 22 dB below the noise level, it seems obvious that adding FT8 spots to our spot flow could have a huge impact on the infrastructure of the RBN," the RBN announcement said. "These numbers suggest that if only 20 - 30 RBN nodes added FT8 spots, those spots could outnumber the total CW and RTTY spots being delivered by the 140 - 150 nodes currently active on the network, doubling the total required throughput." The RBN team said it wanted to find out whether RBN servers would be up to the task before the fall contest season. Read more. Phoenix sailor and radio amateur Timothy Henning, KE7WMZ, has expressed his gratitude to the Maritime Mobile Service Network (MMSN) for intercepting and handling his distress call on 14.300 MHz. Net control operator Harry Williams, W0LS, caught Henning's call requesting assistance with an urgent medical condition on May 23. Henning, some 200 nautical miles south of Ensenada, Mexico, in his sailing vessel Victory Cat, reported that a severe vision problem had developed in his right eye, and he was seeking immediate medical attention and advice. Tim Henning, KE7WMZ, aboard Victory Cat near Greece. "I appreciate, beyond words, that the Maritime Net was able to help us get in contact with the USCG and simply be at the other end of the HF radio, helping us through a challenging time," Henning told the MMSN afterward. "I especially want to thank Harry, W0LS. He was extremely professional and invaluable in linking us effectively with the USCG. 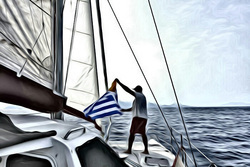 We were just completing our 10 years round-the-world sail voyage." 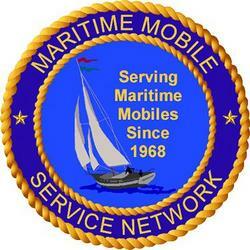 The Maritime Mobile Service Net operates daily on 14.300 MHz from 1700 UTC to 0200 UTC. It is celebrating its 50th anniversary this year. Radio Amateurs in Canada -- primarily in the Province of Quebec -- have mounted a petition drive demanding that members of the House of Commons prompt decisive regulatory action against a Quebec resident who has been causing deliberate interference. The petition does not spell out the particulars of the allegations but says the alleged offender -- apparently unlicensed -- is already known to authorities. Petitioners claim that the individual's "malicious intentions" have been "threatening the security of emergency radio communication in the province," and they called upon Parliamentary lawmakers "to ensure the security" of HF radio communication. "For 2 years, a Nicolet resident, near Trois-Rivières [Quebec], illegally set up a transmitting radio station and is generating interference on purpose," the petition recounts. "Amateur Radio operators in Quebec have identified the illegal radio station and brought it to the attention of Innovation, Science and Economic Development (ISED) Canada, and its inspectors seized the individual's radio equipment." One of ISED's functions is telecommunications regulation. According to the petition, the alleged offender "acquired new equipment right away and returned to jamming the airwaves." The petition identifies the alleged offender as a male who "has regular encounters with the law." "We are calling on the government to provide more support to the Department of Innovation, Science and Economic Development Canada, so that it can intervene more decisively in this matter," the petition declared. Radio Amateurs of Canada (RAC) -- the country's national Amateur Radio organization -- was noncommittal. "While we have not had a chance to investigate the specific details of the incidents [that] the petition refers to, we agree with the importance of acting to support the security of high frequency communications," RAC said this week. By mid-week, the online petition had gathered more than 850 signatures, primarily from Quebec and Ontario. Canada has more than 50,000 Amateur Radio licensees. "Field Day Antennas" is the topic of the current (June 7) episode of the "ARRL The Doctor is In" podcast. Listen...and learn! Just ahead: "Taking Amateur Radio on Vacation." Amateur Radio on the International Space Station (ARISS) has announced that five schools and two organizations have advanced to the next stage of planning to host Amateur Radio contacts with ISS crew members during the first half of 2019. A review team of teachers from the ARISS-US Education Committee selected proposals, moving the process into phase 2. "ARISS's primary goal is to engage people in science, technology, engineering, and math (STEM) activities, and involve them in pursuits related to space exploration, Amateur Radio, communications, and associated areas of study and career options," the ARISS announcement said. The schools and organizations are Faith Christian Academy, Orlando, Florida; Hidden Oaks Middle School, Prior Lake, Minnesota; Huntington High School, Huntington, Texas; Moriah Central School, Port Henry, New York; The Children's Inn at National Institutes of Health (NIH), Bethesda, Maryland; Park County Public Library with Boys & Girls Club of the High Rockies, Fairplay, Colorado, and Pembroke Junior-Senior High School, Corfu, New York. 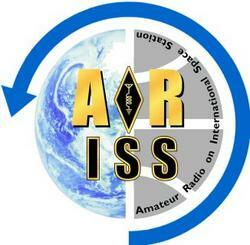 ARISS anticipates that NASA will be able to provide scheduling opportunities for these US host organizations. The candidates must now complete an equipment plan that demonstrates the ability to carry out the ham radio contact. Once ARISS approves the equipment plans, finalists will be scheduled as their availability and flexibility match up with the scheduling opportunities. Read more. CAMSAT, China's Amateur Radio Satellite organization, has offered additional details about the three Amateur Radio satellites it plans to launch later this year. Two of the satellites, designated CAS-5A and CAS-6, will carry transponders, and one of them will offer HF capability. CAMSAT's Alan Kung, BA1DU, told ARRL that the 6U CAS-5A will carry two HF transponders and two V/UHF transponders. The plentiful equipment package includes an H/T (21/29 MHz) mode linear transponder, an H/U (21/435 MHz) mode linear transponder, an HF CW telemetry beacon, a V/U linear transponder, a V/U FM transponder, a UHF CW telemetry beacon, and UHF AX.25 4.8k/9.6k baud GMSK telemetry. 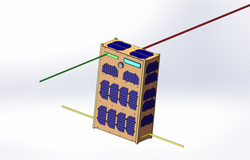 A satellite within a satellite, the tiny CAS-5B, weighing 0.5 kilogram, will be deployed from CAS-5A in orbit. It will carry a UHF CW beacon on an Amateur Radio frequency. CAS-5A will launch from the Jiuquan Satellite Launch Center in late September. Set to be launched at sea, the 50-kilogram CAS-6 microsat will include a VHF CW telemetry beacon, a U/V mode 20 kHz linear Amateur Radio transponder, and AX.25 4.8k baud GMSK telemetry. It will also carry an atmospheric wind detector and other systems that will operate on non-amateur frequencies. Read more. "Iranian radars were very active on our 10-meter band every day [in May]," reported IARU Monitoring System (IARUMS) Coordinator for Region 1 Wolf Hadel, DK2OM, in the IARUMS newsletter. "On 28.860 MHz, we could daily receive the strong and long-lasting signals. Other frequencies were used in [frequency hopping] mode." The list of additional Amateur Radio intruders on 10 meters included -- or in some cases, no longer included -- some of the usual suspects. Hadel reported that FM signals from Russian taxi dispatchers, driftnet fishery buoys, and Citizens Band "abusers" in Brazil have been operating on various 10-meter frequencies, "as usual." Meanwhile, some chronic intruding signals have disappeared. Among the missing is the 14,295 kHz harmonic from Radio Tajik on 4,765 kHz. Radio Hargeysa in Somaliland on 7,120 kHz is said to have been off the air for several weeks due to a transmitter failure. "We did not miss the transmissions," quipped Hadel, who also expressed the hope that the broadcast battle between Radio Eritrea and Radio Ethiopia on 40 meters may now be at an end. For some time now, Radio Eritrea contended with Ethiopian "white noise" interference on 7,140 and 7,180 kHz. This month, Ethiopia announced that it would accept a peace deal with Eritrea to end a bloody 20-year-old dispute. Read more. 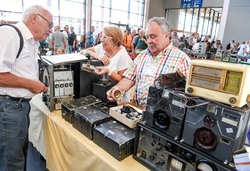 Organizers of HAM RADIO 2018 June 1-3 in Friedrichshafen, Germany, report that attendance at this year's show was down slightly from 2017. The official count of radio amateurs, Scouts, and Maker Faire attendees was 15,460. That's down by 1,650 from last year. The always-popular flea market at HAM RADIO 2018. "HAM RADIO has confirmed its position as the leading Amateur Radio exhibition," organizers said. "It once again proved to be the Mecca for Amateur Radio operators from around the world, the place where the ham spirit is alive." "Radio Scouting -- The Adventure of Youth Amateur Radio" was the theme for the 43rd edition of the international Amateur Radio exhibition. Deutscher Amateur Radio Club (DARC) Chair Steffen Schöppe, DL7ATE, said Friedrichshafen is a social occasion and the emphasis on Scouting was a plus. "For years, we had been talking about how the Scouts could really present themselves on a big scale here, and this year it actually happened. Visitors were very interested in this topic, especially the young ones," he said. DARC is a HAM RADIO sponsor. One commercial exhibitor reported that, despite fewer visitors, their new products sold out on the first day of the 3-day event. ARRL fielded a contingent of representatives to HAM RADIO 2018, headed by President Rick Roderick, K5UR. Show organizers conceded that the date for this year's show was "not ideal" because of conflicting events, and the drop in attendance was not unexpected. Next year, HAM RADIO will return to its traditional late-June position on the calendar. It will take place June 21 - 23, 2019. A Washington, DC-based broadcast journalist and radio amateur, whose ability to speak was severely impaired a couple of years ago by a rare disorder, is adopting a technological solution to return his voice to the airwaves. ARRL member Jamie Dupree, NS3T, suffers from tongue protrusion dystonia, and he has limited speaking ability -- he uses the barrel of a pen in his mouth to help better control his tongue. He had to drop off the broadcast airwaves and turn to print and online journalism to continue covering politics for Cox Media Group's capitol bureau. But now, Dupree plans to leverage technology that will give him a fresh voice. 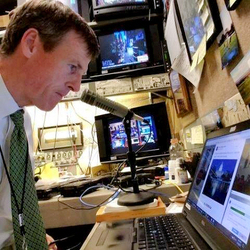 Dupree, 54, a contester and Potomac Valley Radio Club member, said in a blog post this week that his plight attracted the attention of his colleagues at Cox Media Group, who mounted an effort at the company's Atlanta headquarters to find a high-tech solution to get him back on the broadcast airwaves. "What they found was a Scottish company named CereProc, which agreed to sift through years of my archived audio and build a voice," Dupree said. "The big news today is that it looks like that is going to work, and allow me to 'talk' on the radio again." He's calling it "Jamie Dupree 2.0." "Does the voice sound perfect? No. But it does sound like me," Dupree continued. "When I type out some words, the text-to-speech program that I use spits them out in my new Jamie Dupree 2.0 voice." Dupree concedes that the voice will sound robotic to some of his listeners, but "for the first time in 2 years, I will be back on the radio." Dupree said the plan is for him to once again feed news stories to Cox Media Group's news-talk radio stations, putting him back on the air in hourly newscasts, reporting the news from Capitol Hill and Washington, DC. Yasme Foundation Director and Secretary G. Kip Edwards, W6SZN, of Indianola, Washington, died on June 6. An ARRL Life Member, he was 71. Yasme Foundation President Ward Silver, N0AX, said Edwards' death will leave a big hole in the organization. "His organizational skills were invaluable to several major Amateur Radio organizations," Silver said. "He was one of those rare birds who could organize, build, and participate with equal skill." 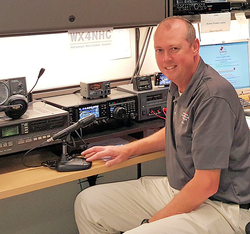 First licensed in Kansas at the age of 11, Edwards' interest in Amateur Radio lapsed as he became involved in school and later a career in the law. He later re-licensed and became W6SZN, joined the Northern California Contest Club (NCCC) and served as its president and newsletter editor. He also was a member of the Northern California DX Club (NCDXC) and served as its president. A prolific and successful DXpeditioner and DX contester, Edwards was on the DXCC Honor Roll. He retired in 2013 and moved back to Washington. 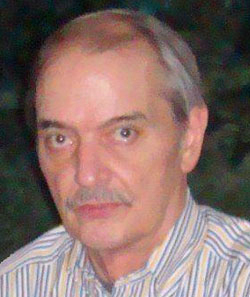 Edwards was a director of the Northern California DX Foundation (NCDXF) editor of its newsletter. "Kip made many great contributions to the Foundation over the years, helping to move it forward in numerous ways," NCDXF President John Miller, K6MM, said. "He was caring, creative and had a wonderful sense of humor. His work will not soon be forgotten." Edwards was a member of the ARRL Maxim Society. Past Japan Amateur Radio League (JARL) President Shozo Hara, JA1AN, died on June 9. He was 91. 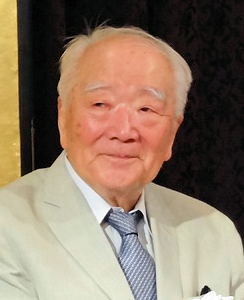 A native of Nagasaki prefecture, he graduated from Waseda University in 1954 with a degree in electrical engineering and joined Eastern Japan Heavy Industries (now Mitsubishi Heavy Industries). Working extremely long hours, Hara once wrote that he'd return home and tinker with Amateur Radio, not getting to sleep until 2 or 3 AM. Hara became a JARL Director in 1972 and went on to serve as JARL President for 41 years. He also was the first president of the Japan Amateur Radio Development Association. Hara's other life interest was horseback riding, which he took up as a youngster. He engaged in and judged competitive events, rode in the Imperial Palace Riding Club, and served as president of the Japan Equestrian Federation. Hara stepped down as JARL president in 2011. He was inducted into the CQ Amateur Radio Hall of Fame in 2003. The ARRL Foundation has announced the 2018 recipients of the scholarships it administers. Eighty-nine scholarships were awarded for the 2018-2019 academic year. The complete list of scholarship recipients is on the ARRL website. Established by ARRL in 1973, the ARRL Foundation is an independent IRS 501(c)(3) organization. It administers programs to support the Amateur Radio community. Support ARRL as you shop AmazonSmile for Father's Day, Sunday, June 17. If you're looking for the perfect gift, we invite you to shop at AmazonSmile and choose American Radio Relay League Inc. (ARRL) as your charity of choice. With every purchase you make at AmazonSmile, Amazon will make a contribution to ARRL. This helps the League to extend its reach in public service, advocacy, education, technology, and membership. Amazon has a large variety of gifts that are perfect for Father's Day including electronics, clothing, ham radio equipment, and more. Make Dad's day, get him something extra special, this year while supporting his favorite hobby. Bookmark ARRL's link and support Amateur Radio and ARRL every time you shop online. FEMA Region X (10), headquartered in Bothell, Washington, will exercise 5 MHz interoperability channels, as an option for disasters and emergencies, on the opening day of ARRL Field Day, Saturday, June 23, 1400 - 2000 UTC. Frequencies are 5.330.5, 5.346.5, and 5.403.5 MHz (USB). Stations from FEMA, the Department of Homeland Security, the US Army, Air Force, and Coast Guard, and the National Weather Service, and Amateur Radio stations will attempt to make contact on the three channels to test interoperability for a major disaster that significantly compromises the telecommunications infrastructure. FEMA Region X will use the call sign WGY-910. Although this exercise takes place over Field Day weekend, it's a FEMA exercise and not an official part of Field Day, which does not give credit for 60 meter contacts. NHC Director Ken Graham, WX4KEG. The annual on-the-air station test of WX4NHC, the Amateur Radio station at the National Hurricane Center was "very successful." That's the word from Assistant WX4NHC Coordinator Julio Ripoll, WD4R. "All of our radios and antennas worked well," Ripoll said. "Even with our equipment maintenance [and] software updates, we were able to make over 150 contacts nationwide, including stations in the Caribbean and South America." Among the guest operators for the May 26 event was the new NHC Director, Ken Graham, WX4KEG. Ripoll said a few dozen contacts were made on the EchoLink Hurricane Practice Net, thanks to Rob Macedo, KD1CY, and the VoIP Hurricane Net team. Tad Cook, K7RA, Seattle, reports: Sunspots returned a few days ago after a 7-day absence. Average daily sunspot numbers dropped from 12.9 last week to 4 this week. Average daily solar flux dropped from 73.2 to 69.4. Geomagnetic conditions were quieter, with the average daily planetary A index declining from 11.7 to 4.4 and mid-latitude A index from 10.4 to 5.1. For ARRL Field Day on June 23-24, a predicted planetary A index of 5 on both days is a good indicator, as is predicted solar flux of 75 and 74. 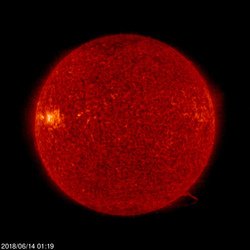 Predicted solar flux is 72 on June 14-20; 75 on June 21-23; 74 on June 24-25; 73 on June 26; 72 on June 27-28; 71 on June 29-30; 70 on July 1-3; 69 on July 4-6; 70 on July 7; 72 on July 8-14; 73 on July 15; 74 on July 16-17; 75 on July 18-20; 74 on July 21-22; 73 on July 23; 72 on July 24-25; 71 on July 26-27, and 70 on July 28. Predicted planetary A index is 5 on June 14-26; 15, 28, 18, and 10 on June 27-30; 5 on July 1-8; 8 on July 9-11; 5 on July 12-15; 8 on July 16; 5 on July 17-23, and 15, 25, 15, 8, and 5 on July 24-28. Sunspot numbers for June 7-13 were 0, 0, 0, 0, 0, 12, and 16, with a mean of 4. The 10.7-centieter flux was 69.3, 68.2, 66.8, 70.2, 69.9, 70.3, and 70.8, with a mean of 69.4. Estimated planetary A indices were 6, 4, 4, 4, 4, 4, and 5, with a mean of 4.4. Estimated mid-latitude A indices were 6, 5, 5, 4, 4, 5, and 7, with a mean of 5.1. Send your reports and observations.